What's All the Fuss About? GET A CONFERENCE PLAN! I have read with great excitement all the various blogs discussing the "good", the "bad", and the "ugly" of the 2010 ASAE Conference. Later you will read my thoughts on the various blogs that sought to share the failures of ASAE at this year's LA Conference. With that one piece of paper, with simply 3 easy things to look for each day, you will find what you are looking for. I know, because our association, by the end of this year will have grown its member surplus 465% since January 2006 because of attacking every conference I attend like this. I hang around the best of the best at ASAE, and I can tell you that if I didn't attend ONE session, I always walk away with those three questions answered, and I make great change after each conference. Did I say 465% in member surplus in 5 years? It happened again at ASAE 2010... I walked away with 3 new ideas to implement, 3 new things I'm going to try differently, and 3 new people who can help me make change. Most of them happened walking down the hall, or hanging after hours with friends discussing what went on in the classroom. Learning is NOT all about the classroom. SECONDLY... if you are not getting a great return on investment, you are hanging around with the wrong crowd. You only learn as much as the attendees around you can conceive. If you hang out with people who aren't great innovators in their associations, and they aren't looking to learn, your return is going to be little. If you are hanging around the BEST MINDS, then your return is going to be huge. If your crowd isn't a great return on ideas at conference, find a new crowd! The one thing I can say about this year's conference is, I'm glad to be a part of an Association that is at least trying new things. Granted many didn't like the, "Guilt By Association" sitcom, but hats off to them for trying something new. Hey, we were in LA! What did you expect? At FSAE's 2010 Conference, I worked with a team to produce our Friday Night Dinner video.... a parody of "The Hangover". It was funny, the crowd roared at the end, but 5% to 10% were still indifferent about the video. If you want to check it out as well as some other creative videos we have produced: CLICK HERE. Bottom line, I feel the conference was a success and not as bad as people stated. Anyone who has planned a conference knows how hard it is to put an event on to make 100 people happy, much less 6,000. Are there things to improve on? Absolutely. Do you take a bat out and start swinging? No. You stand up to be a part of the solution and take action. I think all of the comments were warranted in a variety of fashions. Without the critic, we can never choose to make different choices and achieve greatness. We would continue to bask in our own minds of greatness and never seek to innovate and create new things that are meaningful. When associations say to the critics, who may agree with, "we don't see what you see", it says they think too highly of themselves and have become self focused and not member focused. It's the critics with a good heart and passion for the cause that call us to be the best we can be. Thank God someone is willing to stand up and say what they don't agree with. Too many times in life, like relationships, our friends tell us what we want to hear, not what we need to hear. I applaud those who stand and say what you don't want to hear as long as it isn't selfish, self serving, or a vendetta. I know practically EVERYONE who were bold and shared their dismay with the conference, and so far I haven't read any negative comments that were not spot on and deemed selfish, self serving, or a vendetta. Some just are direct, and some are tactful in how they phrase things. The huge question is "will ASAE listen to the changing dynamic of members?" ...or will they defend their actions and refuse to contemplate changes. As a counselor friend of mine always says, "Never listen to what people say. Watch what they do." I not only say that for ASAE, but also to the attendees. Do you sit on the sideline and criticize, or do you get in the game in which you don't like the game plan? What I love about this process is that a passion has stirred as organizations have done in politics. Bad things happen because good people do nothing. I challenge everyone from this day forward to not speak with your words....BUT SPEAK WITH YOUR VOLUNTEERISM AND ACTIONS. Individually we are mere soldiers, BUT TOGETHER we are an army that can't be stopped. I love my job. I love this industry. I love the people in the industry. I love the associations that bring us together. Thank you ASAE for all you do. These are just a few of the many ways associations can use social media to drive engagement to their members. CLICK HERE to watch my a series of 6 short videos on how to effectively use crowdsourcing in your social media strategy as well as a 25 minute webinar on "Why Start a Private Social Network in Your Association. All can be seen at TomMorrison.tv. In order to have effective and maximized engagement in your social network, you must have an optimum participation between staff and the members with centralization of content and full transparency. CLICK HERE to watch Part 3 of Effective Crowdsourcing Strategies at TomMorrison.tv. Crowdsouring is the key to engaging your members in a private social network. Whether you want market information, choose a new logo for your organization, or engage in industry discussions, Crowdsourcing is the ultimate member engagement tool to find innovative solutions that reach your members where they are. CLICK HERE to watch Part 2 of Effective Crowdsourcing Strategies at TomMorrison.tv. I'm very excited to begin getting serious about a weekly post of key information that can be significant in helping fellow associations establish and sustain an effective Social Media Strategy. I feel public social media sites, like Facebook, are not the long term solution. It is very important associations start today to develop a strategy to launch a private social network, giving them total control of their online process for member engagement. I am going to start this week with an 8-week video blog series on the biggest element of online member connection: Crowdsourcing. Each Monday morning, a new video blog post will appear from TomMorrison.tv. The power of TomMorrison.tv is that it comes from the view of an Association Executive just like you. 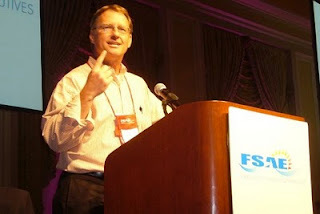 To view Part 1 on Effective Crowdsourcing Strategies at TomMorrison.tv, CLICK HERE. It all started at 11:00 pm on Monday night. It was 3 days before the start of the 2010 ASAE Tech Conference in Washington, D.C. I was looking forward to having a great birthday on Tuesday, and then leaving on Wednesday to catch up with many great friends within ASAE and Young Association Professionals (YAP), while learning the newest things I needed to know to take my association to the next level of social technology. I knew the weather wasn’t the best, but I wasn’t too worried about it. As I was sitting on my couch, enjoying Facebook with some friends, watching television, a friend who knew I was going to DC, sent me two words through Skype that changed my entire week. She simply said, “You there?” Looking back, I couldn’t imagine what was to come from those words. For the next three hours, I was on the phone with AirTran. Finally at 1:30 am, I got someone on the phone and was able to find a seat going to Reagan National airport leaving at 6:20 am….only 4 hours from now. After hanging up with my confirmation number, I’m thinking, “I CAN’T GO TO SLEEP, AND THIS IS CRAZY!” But I wanted to go to the Tech Conference, and nothing was going to stop ME! Around 4:30 am, I made my way to the airport. Everything began to go as planned. I checked in, went through security, bought my Starbucks, and boarded the plane on time. After landing in Atlanta, I got some breakfast to quench my appetite. I was hopeful, yet cautious, knowing that with every hour that passed, the snow was getting closer to Washington D.C. At 9:45 am, I proceeded to walk to my gate for my 11:00 am flight, where I learned that the flight had just been cancelled. To top it off, there were no more flights through AirTran to any of the three D.C. airports today, OR tomorrow. I was struck with shock, and wondered what to do. The gate agent said that I could stay until Thursday and fly out then, or they would send me back to Jacksonville for free. My friend who Skyped me the night before, sent me a text as to see if I was going to make it with the weather issues. I replied, letting her know that my flight had been cancelled, but not to worry - I would get to DC at all costs! I was going to make it to the conference and see my friends! It was now 10:30 am on Tuesday, and I’d been up for almost 29 hours without sleep - and this is where the Amazing Race began! With a cancelled flight, I immediately called Delta and was able to book a flight from Atlanta to Baltimore for 7:25am the following morning. Knowing I had that flight, and that it would most likely be cancelled, I went to work on finding another way to D.C. that day. My next mission was to locate my luggage, which was now in limbo with my flight being cancelled. Checking with the baggage clerk, they indicated my bag would eventually come out the baggage return system. As I was waiting for my bags, I overheard someone say they were flying to Richmond, VA. I immediately pulled out my iPhone GPS and found out Richmond was only 100 miles from D.C. I thought, “I can make this happen.” Upon learning this encouraging news, I called my association friend, Jamie Notter, who’s in D.C., and asked his opinion on the conditions tonight if I drove in from Richmond. He shared that the snow was moving in fast, and that it would be a roll of the dice, but may be worth a shot. He and I agreed that I needed to call another association friend, Ben Martin from the Virginia Association of Realtors, and ask his thoughts about driving from Richmond to D.C. today since he was making the same drive also. I hung up with Jamie and got on the phone with Ben. Ben assured me that things wouldn’t be good later, but if I was going to arrive at the time I planned to, I should be OK to drive from Richmond, and D.C. shouldn’t be under snow yet. With that news in hand, I called Delta and cancelled my Baltimore flight for the following day, went back to AirTran and booked my change of flight to Richmond VA at 1:00pm, booked a rental car from Richmond to D.C., and then worked with baggage claim to get my bag that still hadn’t shown up. It was noon and I was waiting to get my bag so I could just take it as a carry-on instead of checking it. As it grew closer to my flight time, it was imperative for me to get through security and on my flight to Richmond. The AirTran baggage reps were very nice and said, “Get to your flight. I’ll personally see that the bag gets on the 1:00pm flight.” ...Famous last words. Having heard the bag was in their hands, I agreed and I was on my way to Security. As I boarded the flight, I felt a huge sense of relief that I was actually going to make it, and that the worst had taken place on my trip. Little did I know what was to come! As norm for this trip, the 1:00 pm flight to Richmond was delayed until 2:00 pm, which put me closer and closer to fighting an incredible snowstorm in D.C. At 2:10 pm, my flight took off and arrived in Richmond an hour late - 3:30pm. My excitement at baggage turned into desperation as the baggage gates closed and just as I thought, "my bag didn’t make it". I thought, “Wow, if I don’t get my bag soon, they’ll have to deliver it, and will never get through D.C. because of the snow.” After checking with baggage, I learned that it didn’t make the 2:00 pm flight with me, but it had made the 5:00 pm flight and would arrive at 7:00 pm. I asked if they would deliver the bag to my hotel and they assured me it would be delivered within 4 hours of touch down. ...Again, famous last words. I had planned to go out until midnight with friends so as long as my bags were there by then, I was good to go. Next mission objective was to secure my car and get on the road to beat the D.C. snowstorm. As I was at the Enterprise counter getting my car, a nice couple beside me asked if I was going one-way to D.C. They were in a similar situation and wanted to split their car rental fee. They seemed like a nice couple, so I agreed. Their son was picking them up one exit before I had to get off to go to downtown D.C., so it worked perfectly for all of us. As I’m getting in the car, I’m now realizing that I’ve been up for 32 hours and fortunately am not tired, but I am wearing down. For the next hour and forty-five minutes, I enjoy a great ride and good conversation with a very nice couple. The roads seem safe and the snow isn’t catching because there are plenty of cars on the road. Life was grand at this point. Upon reaching Exit 7B, we stopped off at the Comfort Inn just off the highway for the couple to say goodbye to me and be picked up by their son. I ran to the restroom, and got back on the road for the last 8 miles of a seemingly-safe ride in the snow. The next 8 miles turned out to be 8 of the most treacherous, and life-fearing miles I’ve ever traveled. As I was driving on the highway, I heard a loud funny noise coming from the wheels in the back, but didn’t think much of it because the car seemed to drive fine. I chose to ignore it and concentrate on keeping the car straight on the snowy and dangerous highway. At this point, all my friends were calling wondering when I’m arriving. I let them know that I was only 7 miles away and would be there momentarily. ...Little did I know what was ahead! Having never driven through D.C., I worked my way around using my iPhone GPS. I was driving very slow, taking everything easy and making good progress. Everything was fine until I missed the Memorial Bridge overpass...this was when I felt my life was in danger. As I passed the bridge, I noticed I was moving into roads not well-traveled, where the snow was building fast. The small Sentra, with tires that couldn’t grip a sticky road, began to slip, slide, and clip the snow banks on each side of me. Over the next 30 minutes I went up and down roads trying to find my way over the water to downtown D.C. Going back to the Memorial Bridge was impossible as my rental car would never make it back through the snow. Time after time, my car felt as if it was going nowhere, and I thought I would eventually have to just shut the car off and do whatever I could to stay warm. At one point, I truly felt that the car was about to stick in the snow in the middle of nowhere, leaving me stuck in sub-freezing weather with no cloths, no food, and no hope of anyone being able to get to me for 2 days. The thought of waking up in a freezing car under 5 feet of snow, where no one could find me, wasn’t my idea of the 2010 ASAE Tech Conference. I HAD TO GET TO DOWNTOWN D.C.! After 30 minutes of searching for a path through the snow banks, I gazed back down to my GPS, and noticed the road I was on was a straight road that lead over the water to downtown, which put me 1 mile from the Marriott drop-off point for the rental car. I thought, “If I can make it there, I’m home free!” I pushed the RPMs hard, pushing the car to the max, to make it through the snow. I could not get stuck- no one was there to help! As I arrived downtown, the next 30 minutes was a maze of one-way street,s to find which ones I could actually drive down. At one point, I saw the turn for the Marriott, which was one block from me, but because my friends called to get an update, I saw the turn too late and had to go 3 blocks away to find a street my car would actually move on. Finally, I got to the Marriott drop-off point for my rental car! As I got out of the car to find out where to park it, I happened to look back and notice the back right tire was flat. I realized that the funny noise I was hearing on the highway was the tire was flat, and I had been driving on it since I got on the highway 6 miles ago! At this point, I’d been up for 36 hours straight and I really didn’t care. I proceeded to find out the drop-off point was three floors down the parking garage. I drove the car with its flat tire to the bottom of the garage, dropped the keys off, and jumped in a cab to the Morrison and Clark Hotel. Upon arriving at the hotel, I noticed my friends through the door, and they were anticipating my arrival. As I came through the door, I threw my bag to the floor, dropped to my knees with my hands in the air and screamed, “Thank God I’ve made it!! !” I leaned over and proceeded to kiss the floor and hug my friends with great relief. With my journey complete, I freshened up and we all went to dinner as planned. Upon returning from dinner, I received a voicemail on my cell phone stating that my bag wasn’t being delivered to the hotel. The good news is that it had arrived at Reagan National Airport 6 miles away, but wouldn’t be accessible for 2 days due to the snowstorm. For the next day and a half, I refreshed my clothes to make the best of a bad situation. My friends continued to encourage me by constantly saying to me, “Tom, there is something different about you today!” I love their humor. To put icing on the cake, after being up 45 hours with no sleep, traveling a 13-hour incredibly challenging journey to reach Washington D.C. for the Tech Conference, ASAE notified everyone at 3:00 pm on Wednesday that the conference had been cancelled. ...Again, shock set in, but anyone who knows me, knows I would not be discouraged! With that news, our entire group of 8 proceeded to setup shop in the hotel banquet room where we ate, drank, worked, networked, laughed, made videos, took pictures, and brainstormed social technology ideas and strategies. As we were looking to make the best of an extremely bad situation, we realized through Twitter that a groundswell effort was being put in play to pull off ‘UnTech 10,’ a one-day technology conference for those who could attend in person, or live via webcast. As the day wore on, we read and watched through Twitter, as the entire conference and registration began to become reality. As the day ended, we realized that we were actually going to be able to experience a conference after all, and that we weren’t only going to learn about the power of social technology, but we were truly living its power!